The Mets (40-36, 3rd place in the N.L. East) begin a 4-game set with the Dodgers (43-33, 1st place in the N.L. West) in Los Angeles tonight at 10:10 PM EDT. The Dodgers have lost 8 of their last 9 games, and are coming off a sweep at the hands of the San Francisco Giants. This recent run of games dropped the Dodgers into a first place tie with the Giants, after L.A. had held a steady lead in the N.L. West for the first 3 months of the season. The Mets followed their 4-game winning streak with a 4-game losing streak. They lost 2 in a row to the last-place Cubs before steamrolling them in game 3 of the series. L.A. will be without superstar OF Matt Kemp (.355/.444/.719) for the series. Kemp is still nursing a strained left hamstring injury he suffered on May 30. OF Andre Ethier is also questionable for the series after he strained his oblique on Wednesday. Ethier recently signed a 5-year, $85 million contract extension. The Mets will be avoiding a lot of offensive production if both Kemp and Ethier (.291/.357/.491) miss the series. In this video, Steve Berthiaume and Jose Cruz, Jr. of ESPN discuss the Dodgers’ recent woes. 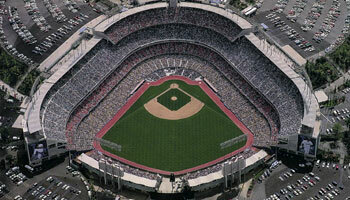 Dodger Stadium, opened in 1962, is the third oldest ballpark in the majors. Only Wrigley Field (1914) and Fenway Park (1912) are older. 1B Ike Davis has 2 doubles, 4 home runs, and 13 RBI in his last 10 games. OF Kirk Nieuwenhuis is working with hitting coach Dave Hudgens in an effort to break out of his recent slump. Kirk is 3 for his last 26. On Wednesday, 4 Mets (David Wright, Davis, Murphy, and Scott Hairston) drove in at least four runs Wednesday, the fourth time a team has done that since the RBI became an official statistic in 1920.